It’s 2035. Back in 1996, a massive proportion of the world’s population have been killed by a deadly virus and those remaining have retreated underground. 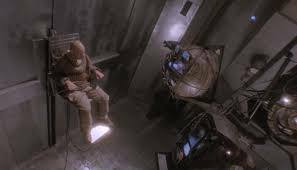 Here, they send ‘volunteers’ to collect samples from the surface, but have also developed time travel technology and send people back in the past to gain information about The 12 Monkeys Army who they believe caused the disaster. When prisoner James Cole (Bruce Willis) is sent back, he ends up in a mental institution alongside Jeffrey Goines (Brad Pitt) and being treated by psychologist Kathryn Railly (Madeleine Stowe). Consequent visits change attitudes until there is more than one fight happening. This is an extremely beautiful film. The future is horrible, the present not much better. (Or should it be the present is horrible and the past is not much better – it’s challenging talking about time travel). The story is typical Gilliam in that it is not typical of anything at all. Any time you think you know what is happening, things twist and turn and change. I saw this film several times back in the late nineties, but haven’t watched it for ages. Seeing it now gives me a different idea on the end, though I am still not sure on quite what happened. 12 Monkeys was nominated for Oscars for Best Actor in a Supporting Role (Brad Pitt) and Best Costume Design.